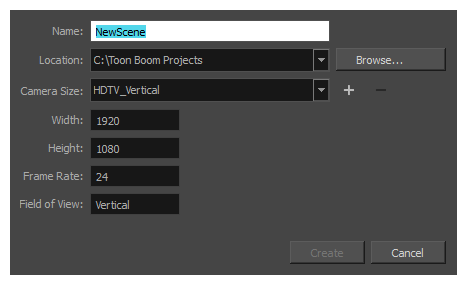 The New Scene window lets you create a new scene. For tasks related to this window, see Creating Scenes in Harmony Stand Alone. Lets you type in a name for the new scene. Lists the locations you used most frequently for storing scenes. Opens a browser in which you can specify a location for the new scene that is not listed in the Location list. Opens a list of resolutions. 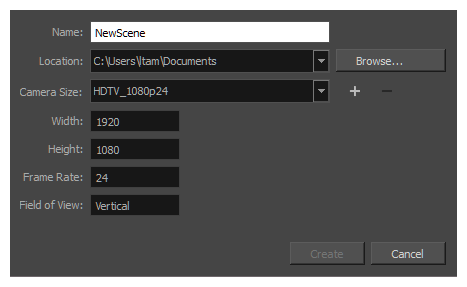 Opens the New Resolution window in which you can create a custom resolution that is added to the Camera Size list. Lets you remove a custom resolution from the Camera Size list. Indicates the width of the resolution you chose from the Camera Size list. Indicates the frame rate of the resolution you chose from the Camera Size list.